Magnussen's career in F1 began with McLaren's young driver programme which led to a race drive for them in 2014. He stepped back to a reserve driver role the following year, and then moved to Renault as a late replacement for Pastor Maldonado for the 2016 season. Another move beckoned in 2017, as Kevin joined the Haas F1 Team. Kevin Magnussen's racing career really began with his father, Jan, who was a Formula One driver in the 1990s. Jan made his F1 debut with McLaren, the same team giving Kevin his F1 break in 2014. With motorsport in the blood, Kevin worked through the usual channels - a career in karting, moving up through the single seater ranks, before putting himself in line for an F1 seat. His first single seater championship was in 2008, where he won the Danish Formula Ford competition in a dominant fashion. With that success behind him, Kevin moved up to Formula Renault 2.0, and continued racing around Europe as he started making a name for himself. In 2010, it was German Formula Three, where he earned the Rookie of the Year award, and in the same year he joined the McLaren Young Driver programme. His link with McLaren, plus some good results in British Formula 3, and Renault 3.5 put him in line for a future race seat with the Woking team. 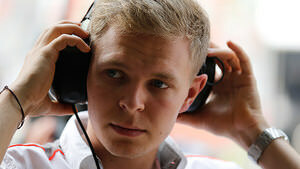 The opportunity may have come sooner than anticipated, as Magnussen was confirmed as a replacement for Sergio Pérez towards the end of the 2013 season. Magnussen had participated in several Young Driver testing events, and driven at both Yas Marina and Silverstone in F1 machinery, but the learning curve was still steep in 2014. He did a good job, and impressed with his professional and knowledgeable style, but found his seat under deep consideration by the bosses at the end of the year. With the arrival of Fernando Alonso from Ferrari, the choice was for youth or experience for the second seat and Ron Dennis opted for experience with Jenson Button. Magnussen remains with McLaren but has taken a test driver role for 2015. Due to Fernando Alonso sitting out the Australian Grand Prix for medical reasons, Magnussen participated in the first race weekend of the 2015 season. Unfortunately, the McLaren-Honda car was struggling and Magnussen suffered a DNS on his one race of the year. Ahead of the 2016 season, rumours started to circulate that Magnussen would be in line for a late seat at Renault. When Pastor Maldonado confirmed his departure from the team due to sponsor and contract issues, it was Magnussen who was drafted in for another full season in the sport. At the end of the year, it was confirmed that Magnussen would join the Haas team for the 2017 season, racing alongside Romain Grosjean. Learn more about Kevin Magnussen with the Pocket F1 Handbook. Having been passed by the Ferrari, Pérez dives into the pit lane and takes on the ultrasoft tyres. He rejoins in the same position, ahead of Kevin Magnussen. Sebastian Vettel easily makes his way past Kevin Magnussen, so that's seventh for the Ferrari now. Vettel makes good use of DRS to sweep past Alonso, he's up into eighth place now. Kevin Magnussen next, but a good nine seconds to close before then. Sergio Pérez dives to the inside of Kevin Magnussen to move up into sixth place, and the roar of the crowd is absolutely incredible. Yellow flags as Marcus Ericsson and Kevin Magnussen crash together. Kevin Magnussen came into the pits for the yellow soft tyres, he's now running last. Meanwhile, Kevin Magnussen and Lance Stroll both earned themselves three place penalties by impeding other drivers in qualifying.